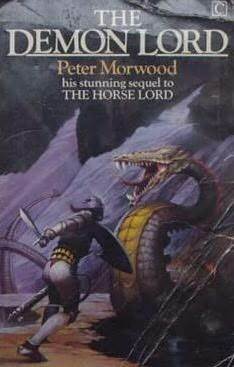 The only reason I actually read this book was because my copy was an omnibus of The Horse and The Demon Lord and I figured since I'd already read half of it I might as well keep going and finish it off. Aldric is now following the orders of King Rynert, who sends him all over the place to do ... things; at least once he was sent to kill someone, so I guess that makes him an assassin. Anyways, one of his missions he ends up meeting a man named Evthan. Evthan's village is currently being terrorized by a beast. As a hunter, people look to Evthan to kill it, but so far he hasn't been very successful. Coming across a stranger in the woods, he watches Aldric for a while before deciding that he needs Aldric's help in killing the beast. Now Aldric is drawn into Evthan's problems, which don't end with the beast. Political intrigue is brewing between Geruath, Overlord of Evthan's country, and Crisen, his son. One of them is using dark powers beyond his understanding. And this is bad news for everyone. This book was as bland and boring as the first one. There's really nothing there at all to draw me in to the plot, or the story. Aldric wasn't suddenly more likeable this time around; although for some strange, unknown reason he's kind of still missing the girl from the last book. And, again, a little more thought should go into the development of two people who are going to end up in bed together. Even if it's just some fling, there has to be some reason why, some connection on a physical level, or even an emotional one - two random people looking to each other for comfort. There was nothing!